AGN (active galactic nuclei) are a hot topic of research, especially now that it is suspected that they play an important role in galaxy and structure evolution. AGN are supermassive black holes at the centers of galaxies that are actively accreting material. As the material falls into the black hole it emits radiation, allowing us to see what would otherwise be a giant but invisible object. In an unobscured state, rapidly accreting AGN are called quasars, and are among the brightest objects in the universe. This makes them relatively easy to find. Sometimes, however, the AGN is surrounded by gas or dust, either near the black hole or farther out in the host galaxy. This can make galaxies with AGN hard to distinguish from galaxies that don’t have nuclear activity, but are undergoing phases of rapid star-formation which make their spectra look similar. These obscured AGN are possibly the most interesting objects to study, because it is during this phase that the black hole is thought to produce some of its greatest effects on its host galaxy, for example emitting winds or jets that could shut off star formation. Thus, being able to distinguish AGN from star-forming galaxies is important, and for several decades, the most commonly used method has been the BPT diagram. This figure (from Caccianiga et al. 2004) shows the spectrum of a narrow-line AGN. 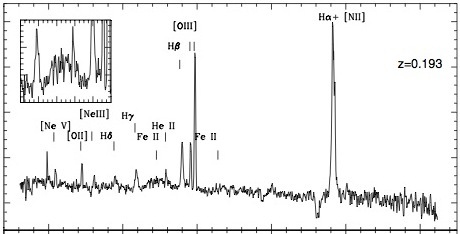 Labeled are many emission lines used to make BPT and other diagnostic diagrams. Named after its creators – Baldwin, Phillips, and Terlevich – the BPT diagram uses the ratios of specific emission lines in galaxy and AGN spectra to distinguish the two. Traditionally, the ratios used are [NII] / Hα on one axis and [OIII] / Hβ on the other. (Why the brackets? Because these lines are “forbidden” transitions, which tend to occur only in the very low densities one finds in space.) You can see all of these emission lines in the two narrow-line AGN spectra in the figure above. As the figure shows, these are among the strongest emission lines in an AGN spectrum, and therefore usually easy to distinguish. Because lines like [NII] are only excited by high energy photons, an AGN will generally have a higher ratio of [NII] / Hα than a galaxy, whose highest energy photons are limited to those that can be produced by massive stars. An example of a BPT diagram created with spectra from thousands of galaxies in the Sloan Digital Sky Survey (SDSS) is shown below. 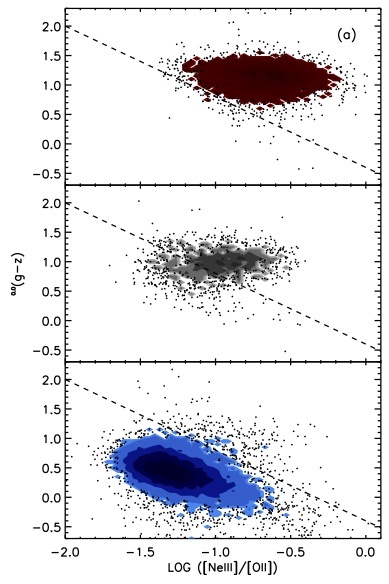 This figure shows galaxies (blue), composites (grey), and AGN (red) separated on the traditional BPT diagram, with line emission ratios on each axis. So if the BPT diagram works so well, why change it? The answer lies in the fact that as one looks to galaxies that are farther away (at higher redshift, z), the emission lines needed to make a BPT diagram quickly shift out of the optical window and into the infrared, where getting spectra is much, much harder. In fact, beyond z > 0.4, the BPT diagram can no longer be used! In 1981, when it was created, a redshift of 0.4 was still relatively high, but now it seems practically nearby. Therefore, the authors of this paper have created a new diagnostic, similar to the BPT diagram, but which relies on the emission lines [NeIII] and [OII] that are at shorter wavelengths (see the spectra above), and uses a completely different feature for the y-axis – restframe (g-z) color. The authors call this the TBT diagram (after their last names – Trouille, Barger, and Tremonti), and in their paper, they show that it works just as well as the BPT diagram to separate star-forming galaxies from AGN, is actually BETTER at finding AGN that are X-ray obscured, and best of all, can be used out to z = 1.4. The "TBT" diagram, which uses the NeIII to OII ratio and (g-z) color to classify objects as AGN or star-forming galaxies. Shown at right is an example of the TBT diagram, made with the same SDSS galaxies that were used to create the BPT diagram shown above. The dashed line is the authors’ empirical cut between star-forming galaxies and AGN. 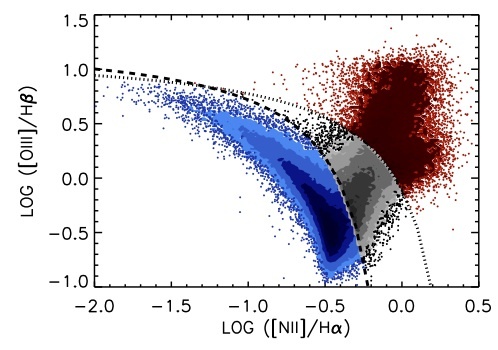 As the figure shows, the TBT diagram cleanly separates star-forming galaxies (shown in blue) from AGN (shown in red). The intermediate galaxies (shown in grey), are traditionally called “composites”, because their emission lines are probably excited by a combination of ionizing photons from stars and from an AGN. Unlike the BPT diagram, the TBT diagram places the majority of composite galaxies on the AGN side of the dividing line. To test whether this is valid, the authors look for X-ray emission in these composite galaxies – a sure sign of AGN activity. They find that the galaxies do in fact have weak X-ray emission, indicating that there is probably a heavily obscured AGN at their centers. In addition, the authors find that the TBT diagram places almost all X-ray selected AGN in the correct region, which the BPT diagram fails to do (see Figure 4 in the paper). They suggest that perhaps the TBT diagram does such a good job distinguishing AGN because the [NeIII] emission line it relies on has a higher ionization potential than [OIII], making it a better probe of the high-energy photons that can only come from AGN.